WEST MONROE, LA – Good Monday morning! We’re off to a chilly yet close to seasonal start across the ArkLaMiss with temperatures in the lower 40’s. We have a few higher clouds streaming across the area as well. As high pressure remains over us, allergens will be the most exciting thing weather-wise. We will see hightened allergens across the ArkLaMiss, as we won’t have anything to wash the air clean. Expect the nice weather to stick around for much of the extended period. 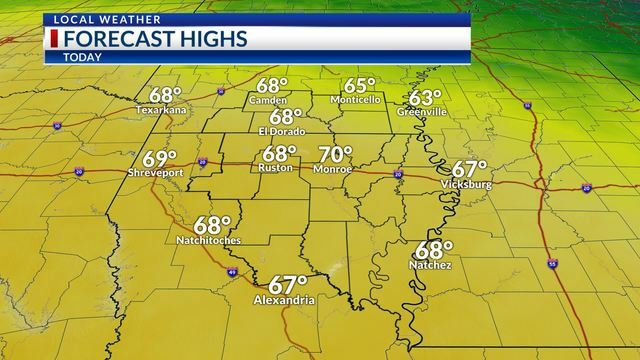 Each day will will be warm, with highs in the 60’s and 70’s. A few clouds will be around as well. Wednesday a weak system may bring a few isolated showers to locations mainly north of I-20. Not expecting a wash out by any means, but enough to put them back into the forecast. Unfortunatley, it is looking more likely that rain chances will return as we get towards the weekend. Timing keeps shifting around, but it looks like showers and storms will return as early as Sunday. Enjoy the nice, dry weather while we have it!